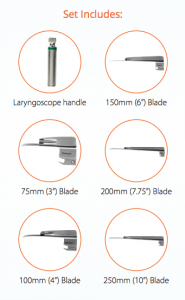 The Darvall Veterinary Laryngoscope Set is a seven-piece set designed specifically with veterinarians in mind. The set’s handle contains an LED light source with a fiber optic light bundle. Each separate component is available in a left-handed or right-handed configuration – a unique feature in today’s veterinary market. In addition to the full range of standard sized Left-handed and Right-handed blades, Darvall also makes these specialty-length long blades. Q: Will these blades fit the handle I already have? Answer: Many times, yes. 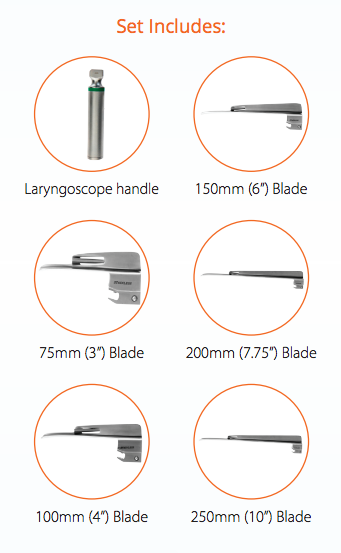 Darvall specialty-length blades work well with many commercially available handles. However, these blades are manufactured to the specifications of Darvall handles, and therefore may not fit properly on the handles you already have. If you want to be sure before you buy a handle, we suggest you select and purchase the specialty-length blade to best suit your needs and try it on your handle. If it’s not a perfect fit to your handle, then purchase one of our long-life LED light handles.